Portland Rose Bearfoot was the Mountain Colors entry into the Sock Summit/Ravelry Dye for Glory contest. It was very well received in Portland at Sock Summit and now all of you who couldn't attend that show can order some too! The color comes only in Bearfoot yarn and we welcome special orders through any of the Special Orders shops listed on our website. Or contact your local yarn store and have them order some! It is great for socks, sweaters (held singly or doubled), baby clothes, etc. 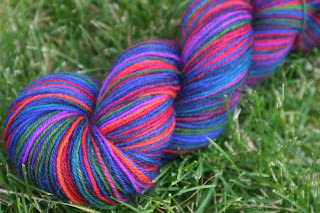 Don't miss out on this fun new colorway! Have a wonderful August and happy knitting! !